Bush fire arson is a crime. 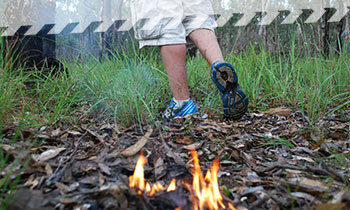 The NSW RFS and NSW Police Force are committed to fighting bush fire arson. Bush fire arson is dangerous. It can destroy lives, properties and have long term effects on the environment. It is also costly for the community with the loss of properties, cost of firefighting resources and the disruption to businesses. If you see something that looks out of place, this may be what Police are looking for. If you can, record the details of vehicles such as the make, model and registration of suspicious vehicles. Also take note of the appearance of anyone acting suspiciously. Report suspicious behaviour to Crime Stoppers on 1800 333 000. The NSW RFS works closely with the NSW Police Force and other agencies to investigate arson. Knowing the cause of fires can help provide accurate data, focus prevention campaigns and to prosecute people who negligently or deliberately light fires. The NSW RFS has more than 150 highly skilled investigators who work to identify the origin and cause of fires. A fire investigation may take place for a number of reasons. These include injury or death, significant property damage, if the fire is believed to have been deliberately lit, or the identity of a suspect is known. In 2013/14, more than 560 bush and grass fires were formally investigated by the NSW RFS. The majority of these investigations were conducted in cooperation with NSW Police, resulting in several charges being laid. There are heavy penalties for people convicted of deliberately lighting a fire. A person convicted to recklessly or intentionally causing a bush fire can be jailed for up to 14 years. Where a person deliberately lights a bush fire to damage the life of another person, the person can be jailed for up to 25 years. Recent amendments to the Rural Fires Act have substantially increased fines for deliberately lit fires. Anyone who lights a fire on a day of total fire ban can be fined $2200. If a person allows a fire to escape their property on a day of total fire ban, fines of up to $132,000 may apply, or prison terms of seven year. Legislation is regularly reviewed by the NSW RFS and amended where appropriate to ensure fire investigators have the ability to conduct thorough enquiries. For example, the Rural Fires Act was recently amended to provide fire investigators with the power to enter any land for the purposes of investigating the cause or origin of any fire for a period of up to 24 hours after the fire has been extinguished. Subsequent arson investigations are undertaken by the NSW Police Force. There are various other pieces of legislation that assist authorities whilst investigating arson.